…Ticket to Ride – or ‘Zug um Zug’ in the German version. However, it took more than seven days, but rather 104 years, until the tale of these five unnamed travellers were to be put into a game that went on to win several awards and prices, including the 2004 Spiel des Jahres and finalist of the World Games Awards, winner of the 2005 Origins Award and the French As d`Or – Jeu de l`Année. There are several versions of the game now, but we focus on the original here. Anyway: the game was greeted with lots of laurels, and not for nothing. In game, each player (2 to 5 are the options, but 3 to 5 are the best numbers for enjoying the game in full) takes over a coloured set of wagons, while the map aka playing field is stretched out in the middle of the table. You will need a fair amount of space, though no Kingsburg-like snooker-sized table. Your goal is to gain as many victory points (no surprise here) as possible, which is achieved in two (officially: three) ways: Firstly, you get points for building connections between cities, marked on the board by wagons of your colour. The longer the individual connection (more on that later), the more points you get. Secondly, you are being dealt destination cards, each card indicating two cities and a point score, which is equal to the minimum number of wagons required to connect them using the shortest possible way. Basically, these cards are your ‘bets’: fulfil them and earn their point value – fail and lose the points. You get these cards at the beginning of(compulsory) and during (voluntarily) the game – and these are even more essential to winning the game than the points for individual connections. The third way to get points is a bonus card for the longest continued path at game’s end, but that can be treated as an afterthought in most games, until maybe the very end. Forget about that for the time being. As for game materials, we have already mentioned the board and the coloured wagons which you get in pre-game – 45 plastic ones each, plus one coloured score marker. Then there are two further sets of cards: train car cards (consisting of equal amounts of wagons in eight colours plus rainbow-coloured ‘locomotive’ wildcards – 110 total in the original game) and 30 destination cards (as sketched above). That’s all – except maybe for noting the scoring track which runs around the game board (and which has some serious flaws in at least one German edition), where the score markers are placed at 0. In preparation, each player is dealt four train car cards and three destination tickets, of which he must keep two and may keep all. The remaining train car cards are arranged as a stack, and the five topmost cards are turned face up and played individually next to the stack. Also, the remaining destination tickets are put aside face down for later use. This means that you either draw, or you build, or you set out to new adventures – never more than one in your turn. As for drawing cards, you always have the option of drawing from the five face-up cards, or draw the topmost card of the stack. Whichever you take, you can take a second card – with the lone exception being face-up wild locomotive: if you take a face-up locomotive as your first card, you do not draw a second. If you already drew a card, your second one cannot be a locomotive; face-down cards from the stack are never revealed, so even if that is a locomotive, it does not count as one in this regard. If you take a face-up card, the gap is immediately filled, even before you take card #2. This is nice, with one small exception: as soon as the open cards contain three locomotives, all open cards are immediately put on the discard pile and five new cards are placed there. This can be truly disturbing when all you wanted was that elusive second green card as well…. %&$!?…!!!! You don’t get any points for that – but there also is no hand limit, so it always makes sense to take a second card. Anyway, on to the next option: Build one (entire) connection, which you can do anywhere on the map (no need to build connected like in Transamerica. Connections differ in terms of length (number of slots) and colour. Length is quite obvious: you need one suitable card and one of your plastic wagons for each slot of the connection. Since you can only build the connection as a whole, this means you pay the necessary number of cards for the full connection (length ranges from 1 to 6) and place one wagon on each of the slots. As for colour, you will note that while there are many tracks printed in gray, there are also lots of links printed in colours. Once you notice there are eight different colours, you are half-way to the realization that these correspond to the colours of the train car cards. And yes, in order to build on a coloured track, you need cards of the corresponding colour. For the gray tracks, you need cards of identical colour, but which is of no relevance. The wildcards are handy because they can replace any card in either scenario, and there is no limit on using them within a connection (e.g. building a four-slot red track with four jokers is fine). In order to build the track, you show the cards and put them onto the discard pile, then you put your wagons where they belong. Obviously, a track that has already been built on is blocked, which is your main area of interaction with the other players. But what about the double tracks on some major lines – well, these can of course both be utilized (however not with 2-3 players). Still, for all tracks it is a good advice to build short but essential links soon, even if it somewhat gives away your routes – nothing is worse than building long tracks only to be denied on a 1-slot connection and running out of wagons finding a detour. 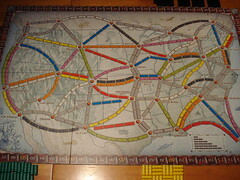 Technically, this is where points for the connections (a 1-slot track gives you one point, which skyrockets to 15 for a 6-slot track) are indicated on the score track. In actual practice, however, we tended to forget about these at some point and then had to recount over and over. Since you can simply count them at the end, too, we stopped scoring in-game, but that is totally up to personal taste. Finally, there are the further destination tickets. You need to know that destination tickets come in vastly different flavours (=scores): the shortest in the original set is 4, the longest is 22, and most of them have a dominating north-south (usually shorter) or east-west (longer) connection. Therefore, your initial set of three cards will go a long way to defining whether you start building a short-link network in the east, or go cross-country in long leaps across the western territories. It also defines if, when and how often you will dig back into the destination ticket pool. Usually the best time to do so is when you approach completion of your previous assignments, and there are no attractive cards available. Monitor the other players’ remaining wagons and when they last took new destination tickets to evaluate the remaining game duration (more on that in a second) before taking new cards. When you do, you get three new ones but this time you are bound to keep only one of them. This is where luck is a big factor: you can get cards which you have already completed or for which you only need to build one or two short tracks, but you can also be left reeling with totally unconnected links. This is a particular risky proposition late in the game, with few wagons left, so that requires some experience. Sometimes building a long connection to gain 10 or 15 points can be the safer alternative. Also at this stage, the longest continuous path card may merit consideration. This gives ten points of the longest uninterrupted track from any A to any B built with your colour, without using any track twice. So if you have a shot at challenging for or claiming these points, this has some credit to it at this stage. 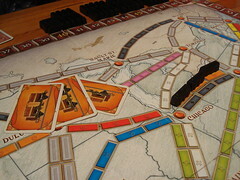 Which leads us to the end of the game: Once any player builds a track that leaves them with less than 3 wagons in stock, the final round of playing starts: Each player (including the aforementioned builder) has one final turn – which almost always comes as a shock to at least one player who always ‘needed that ONE more round’. No mercy, though. One turn per player, then it is counting time! First, it makes sense to establish who has the longest continuous path and award the card accordingly – if it is several players they all get full ten points. (If you kept score of the connections in-game, it makes sense to re-count now). Then the players turn over their destination tickets and starting with the game terminator, all cards of one player are checked on their completion and points awarded or subtracted, respectively. After this was done for all players, it is time to count the points gained for connections (unless you are assiduous enough to do it in-game). To do this, simply take the individual connections off the board and simultaneously move the score marker. After this was completed, you have your winner, and quite possibly another go at the game. So much for mechanics, but what to make of the game?! Well, personally I like the game a lot. The rules are very simple for a modern board game, which makes the game easily accessible basically from the first game on. And it holds true even for experienced players by keeping the player’s exact assignments unknown to the others, each round staying attractive long enough by keeping everybody involved. The change of cards, destination tickets and available cards allows for a reasonable modulation in terms of situations to not grow old in a hurry. It offers enough strategic attraction to keep your mind involved (draw or build? Where to build? Take more destination tickets?) while keeping a sound relation with the luck factor (what train car cards are turned over? What destination tickets do you draw? ), and a sound amount of interaction (getting your ideal path blocked by others, evaluating other player’s destinations, strategies and the remaining game duration). To be fair: yes, after a few hundred games you will have seen it all, and with certain combinations of destination tickets you will be hard-pressed to win, especially if you only get short Eastern connections which only yield minor points due to the short connections and almost no shot at the longest continuous path – but since you never know how well the others are doing with their (potentially) longer assignments, the game usually does not wear on you until possibly at the late stages. The ‘historic setting’ has actually very little bearing on the game (how can you travel by hopping all across the continent? ), but that is no real harm. Once you have your destination tickets in hand, all you focus is on the best way to connect those damn cities. Also, it must be noted that the extensions (even minor ones like the 1910 card set) have addressed these minor weaknesses by adding further bonuses and assignment types. Game time is firmly below one hour, which makes this one of my best recommendations for occasional players who like to be entertained without immersing themselves deep into strategic considerations. I do not prefer the two-player version, but all other numbers are fine. 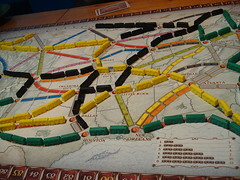 The four-player version holds least conflict potential in building certain connections, with five and three players (for the latter: due to the non-existence of double tracks) there will be more detours, preceded by some light ‘that was MY track’-grumbling. Oh, and by the way: What the hell do I need to go to Duluth for!? !